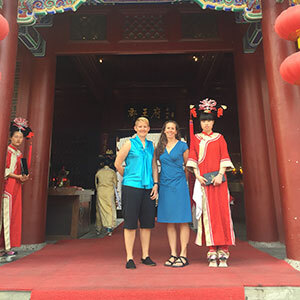 China was a country I had never really thought about visiting, that is until I received an invite from the Beijing Institute of Education, Chaoyang Branch, to teach physical education teachers for a weeklong intensive Physical Education Training Program. As part of the trip, we were provided with interpreters and tour guides and taken to somphye of the most famous locations around Beijing. How could I say no? As an added bonus, my colleague from Western Oregon University, Gay Timken, had also been invited, and we would be working together to plan and organize our teaching materials. She would be teaching the secondary physical education teachers, and I would be teaching the elementary physical education teachers. The date arrived, and we were both still in disbelief that we were traveling to China. We were going to China! I’m pretty sure we loudly repeated a similar phrase over and over again. We landed in Beijing on a Friday afternoon and proceeded to wait in a mass of people for almost an hour to get through customs. This was our first real experience with having our personal space invaded, and something that we got very used to by the end of the trip. In fact, I became so good at it that by the end, I was pushing and wedging my way through crowds. We were met by our contact in China, Kate, and one of her coworkers and the driver. It was incredibly helpful not having to worry about transportation! We were provided with a driver to just about every location we traveled. 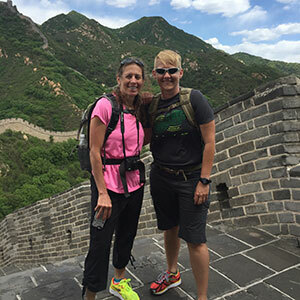 During the first weekend, we visited the Forbidden City, the clock museum within the city walls, took a bike carriage ride through an ancient Hutong area, walked through Jingshan Park, visited Tiananmen Square, and spent several hours hiking on the Great Wall of China. The Great Wall was amazing and probably the highlight of the trip for me. Not only were we out of the city and in beautiful mountains on a gorgeous day after a full day of rain, but the structure was awe-inspiring. When we arrived, our tour guide/interpreter asked if we wanted to take the cable car up the first section and then hike from there, or if we wanted to hike from the bottom. As physical educators, we immediately responded we wanted to hike from the bottom. I’m pretty sure there was an eye roll and groan that followed, but she was a trooper and entertained our request. There were sections that were extremely steep with no steps, and other steep sections with varied step sizes. And people along the entire section! Not only was it crowded, so many were very old or very young, and they were hiking up and down as if it wasn’t a challenge in the least. That was truly incredible to me. Several times throughout our day, we were stopped by Chinese families to have our picture taken with them. We stood out just a little bit. Day one of teaching was held at The Institute and began with an opening ceremony, during which they introduced the various professors from different countries who would be teaching throughout the week. This day, Gay and I were provided with a large lecture space that allowed for us to teach together. It didn’t take us long to figure out how to teach with an interpreter, and by the end of the day, we had it pretty well figured out. We also came to realize that the teachers in our groups were just like the teachers we interact with here in the States – they preferred to be moving and not sitting. Day one left us absolutely exhausted. We worked with 60 teachers in the space and did a bit of presentation modification on the fly. Prepping for this trip was quite difficult, as we weren’t quite certain what kinds of spaces would be available and what the teachers really wanted or needed, so we ended up spending most nights reworking various aspects of our teaching plan. The first night, they took us to look at the school where we would be teaching for the rest of the week. The school provided us with two classrooms and access to gym spaces. The facilities in the school were amazing, and the teacher from the school was accommodating. Throughout the week, he did everything he could to get us into the gym spaces when we asked. The week followed a very similar pattern, with some time adjustments each day. 8 a.m. Leave for the school and drive through the most chaotic traffic I have ever experienced. There were a few occasions when we thought we may die. 11:30 a.m. Lunch, which was an amazing buffet lunch provided by the school for every teacher in the school. We taught activities typically included in elementary and secondary lessons in the United States. These included cooperative games/team building, fitness, intros, classroom physical activity breaks, dances and even Ultimate Frisbee and speedball. Teaching Ultimate was fun because they had never seen it before and had very little experience throwing Frisbees. They loved it! All of the people we interacted with were so gracious and kind. They went out of their way to make sure our trip was enjoyable and that we had everything we needed. The teachers in our groups asked great questions and were really engaged and interested in the conversations and activities we shared. I have even interacted with a few of them since leaving, and they have shared materials and videos of their own classes. I had my heart set on trying scorpion on a stick, which I didn’t get to try, but I did get squid on a stick at the base of the Great Wall of China. Tasty, but nothing really new there. Foods got more fun as we went along. Overall, the food was fantastic, and I became pretty good at using chopsticks. There were times when I wasn’t quite sure what I was eating, but some of the more unique foods included jellyfish (loved it! ), pig’s ear (pretty tasty), pig’s liver (loved it! ), chrysanthemum leaves (loved it! ), Peking duck (loved it! ), variety of fish (tasty, but had a hard time with bones in everything), chicken feet (not so enjoyable), a whole turtle (had a hard time with that one), and a huge variety of roots and leaves. Each night of the week was booked with a different event. We attended a Czech opera performance at “The Egg” (Beijing Opera House), went to the LaoShe Tea House for a performance, and had dinner with the Beijing Educational Authority. The day we left, we spent the morning wandering around the complex that holds the Temple of Heaven. Would I go back? Yes, I would definitely return if invited back. The overall experience was, to use the word again, awesome. It was an exhausting adventure, but so rewarding and a great learning experience. Plus, I still need to try scorpion on a stick.